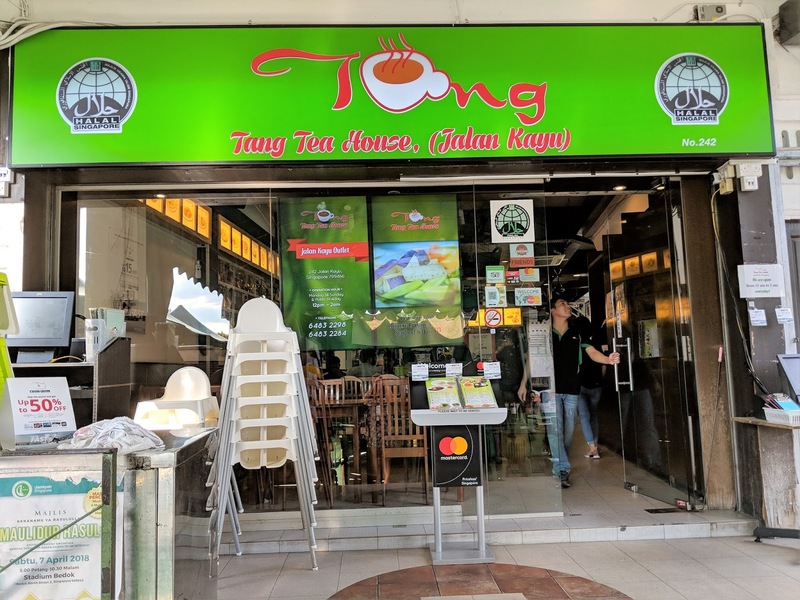 Tang Tea House is a MUIS certified Halal restaurant located at Jalan Kayu, serving DIM SUM and ZI CHAR. Dim Sum refers to small bite-sized portions of food usually served in steamed baskets. 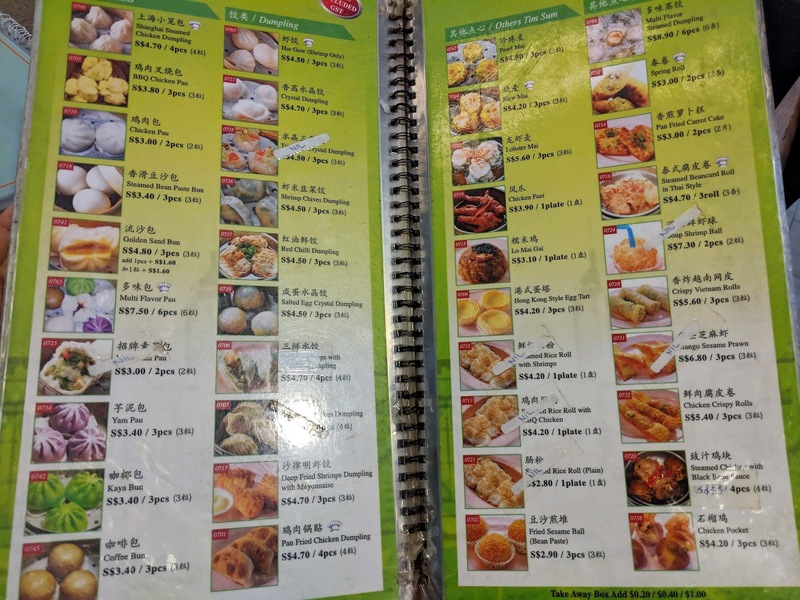 The items we usually order at Dim Sum restaurants are Har Gow, Siew Mai, Xiao Long Bao, Lo Mai Gai, Egg Tarts and recently, Hong You Chao Shou. 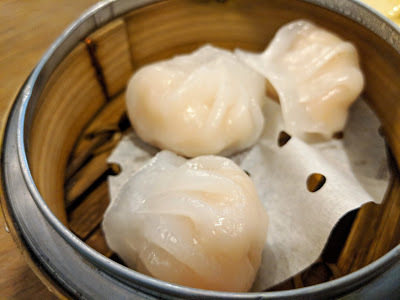 Har Gow refers to prawn dumplings; Siew Mai, Xiao Long Bao and Hong You Chao Shou are usually meat dumplings cooked in different styles. Lo Mai Gai refers to steamed glutinous rice with chicken. We were pleasantly surprised with Tang Tea House extensive menu. 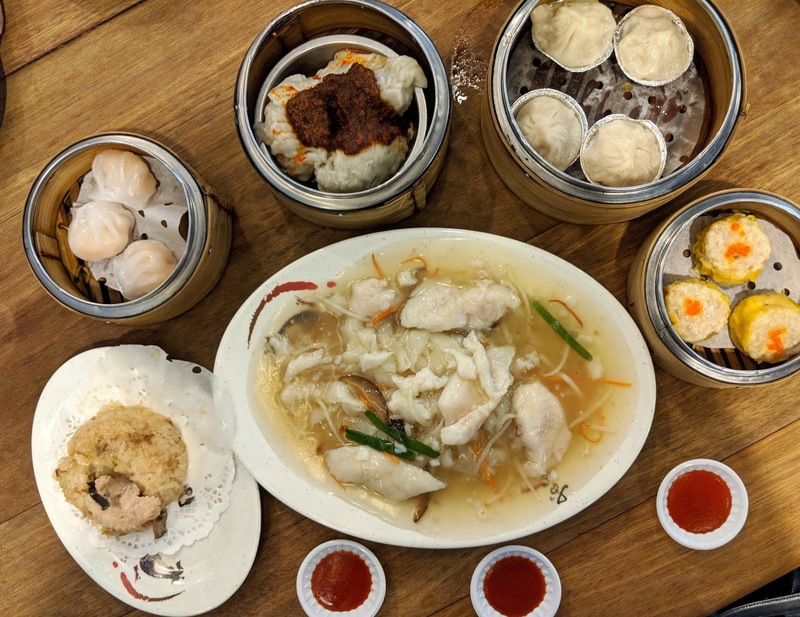 It has a variety of Dim Sum items and today, we put these six common Dim Sum items to the test. The Lo Mai Gai (steamed glutinous rice with chicken) was delicious. It cost S$3.10. The rice was steamed to perfection as it was very soft and flavourful. 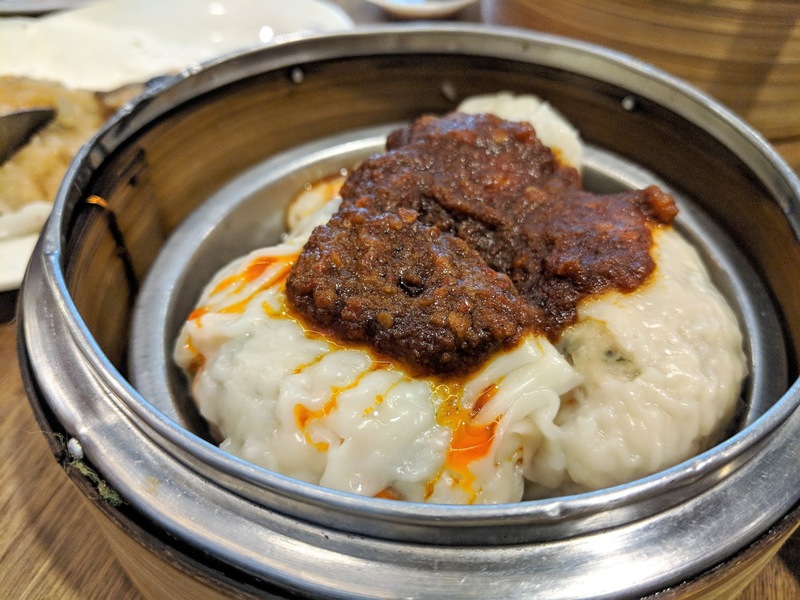 I recommend this item if you are trying the Dim Sum at Tang Tea House. 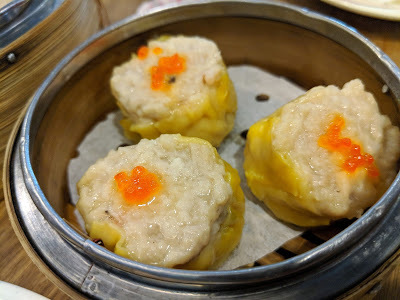 Siew Mai is usually prepared using pork at Non Halal Chinese restaurants. At Halal restaurants, pork is replaced with chicken. The marination was well done. The texture also resembled the original version. It was definitely not one of the best Siew Mais but it will do the job if you are craving for Dim Sum. 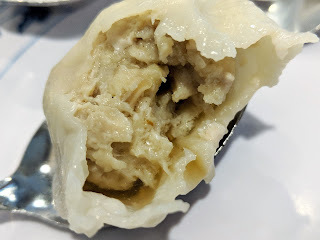 The dish of the day was Xiao Long Bao - Shanghai Steamed Chicken Dumplings. It takes skill to make Xiao Long Bao because the success factor of this dish is to ensure that the dumpling skin is not too thick and yet thick enough to hold the chicken soup within the dumpling. 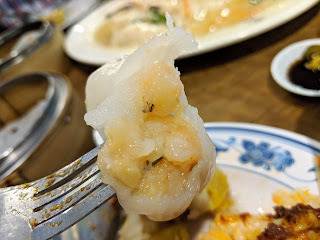 Look at the soup that is contained in the dumpling! 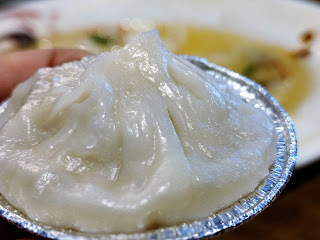 When I bit into it, the soup oozed out from the dumpling and that is the shiok factor of any Xiao Long Bao. 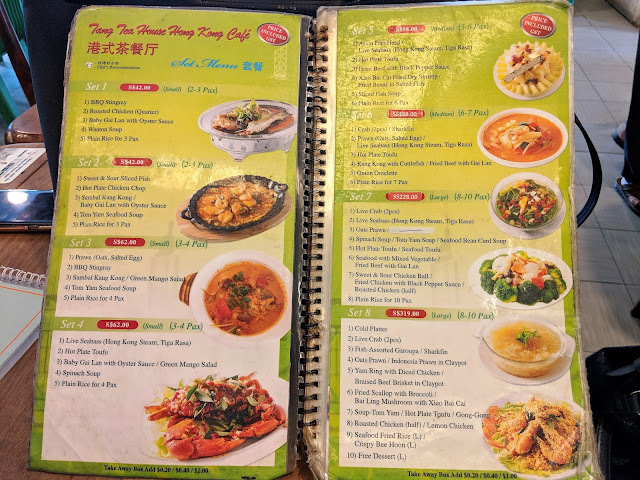 The interesting thing to note was that the soup tasted like an authentic chicken soup! Sedap! The skin was also good and the meat was well marinated. I highly recommend this dish as an experience. Of course, Ding Tai Feng still wins hands down. 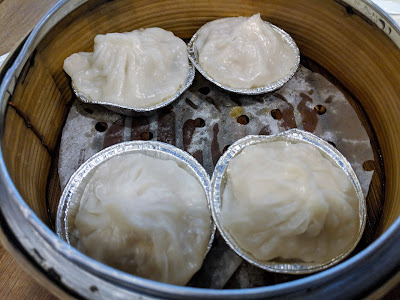 It is very difficult to find delicious Har Gows in Dim Sum restaurants. The skin is usually too thick. Tang Tea House's version of Har Gows is pretty disappointing as the skin was too thick and tasted very doughy. The prawn filling was also disappointing because the prawn was too minced for our liking. It also did not taste like fresh prawns. 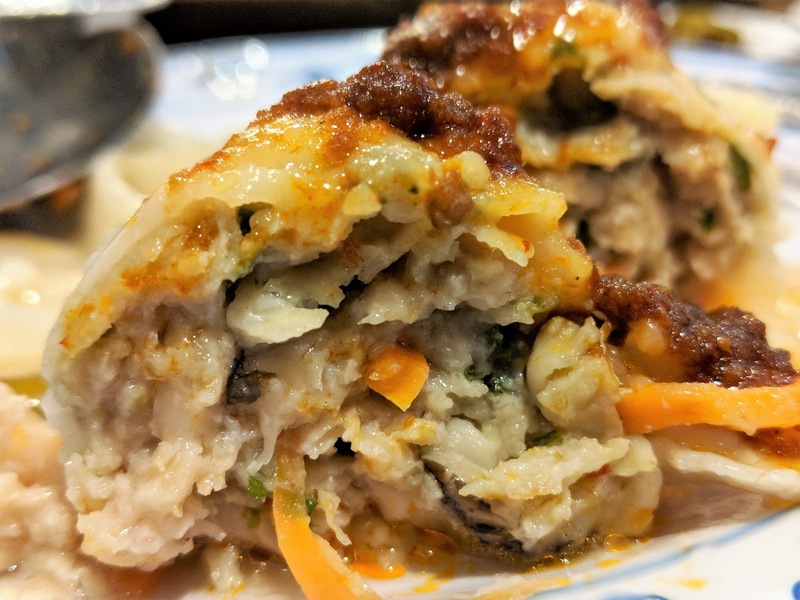 The Hong You dumplings tasted nowhere near the usual versions served at Chinese restaurants. Firstly, the wrong type of chilli was used. Secondly, vinegar was lacking! The meat filling tasted bland. The only redeeming factor was that the dumplings looked very huge. The egg tarts looked very appealing as the egg custard looked fresh and there was a sheen, reminding me of Tai Cheong Bakery Egg Tarts. The crust itself was not as delicious as Tai Cheong. It reminded me of Prima Deli. 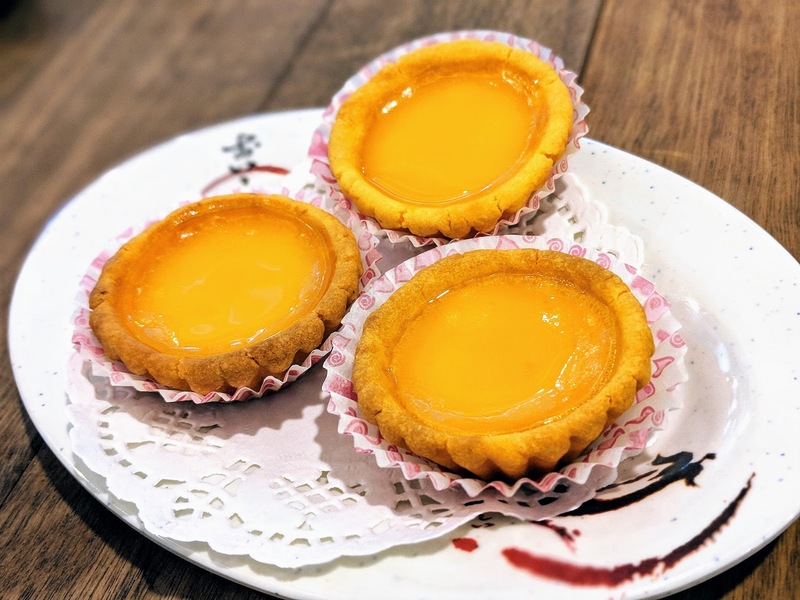 I will recommend the egg tarts as a dessert and they are perfect for an afternoon tea. 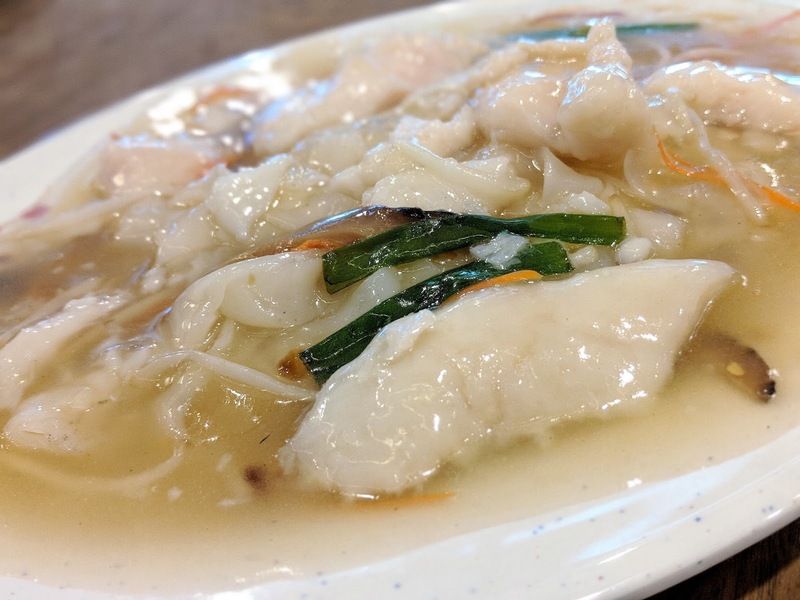 San Lau Hor Fun refers to tossing three ingredients in the wok - bean sprouts, fish slices and Hor Fun. This dish usually looks very plain and the secret lies in the Wok Hei (the fragrance of the char caused by a heated wok). Tang Tea House San Lau Hor Fun was lacking in Wok Hei but it was still tasty. It is not a Must Try but it sure looks like a healthy option for elderly. The dish tasted very healthy as it was rather bland. 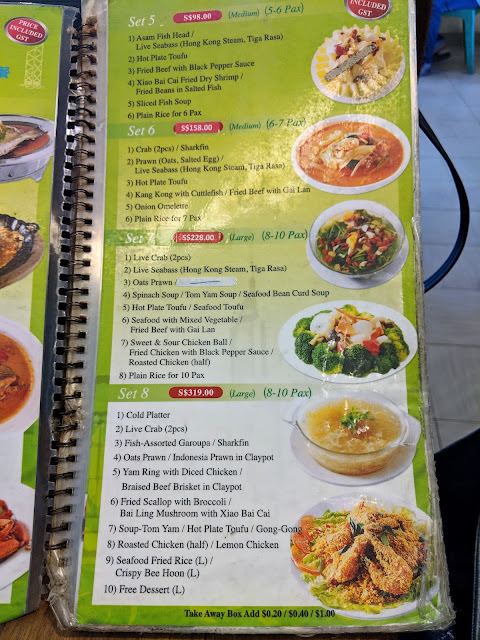 I had no issues with it as I enjoyed the soup and my intention of ordering a vegetable item was to have a balanced meal. 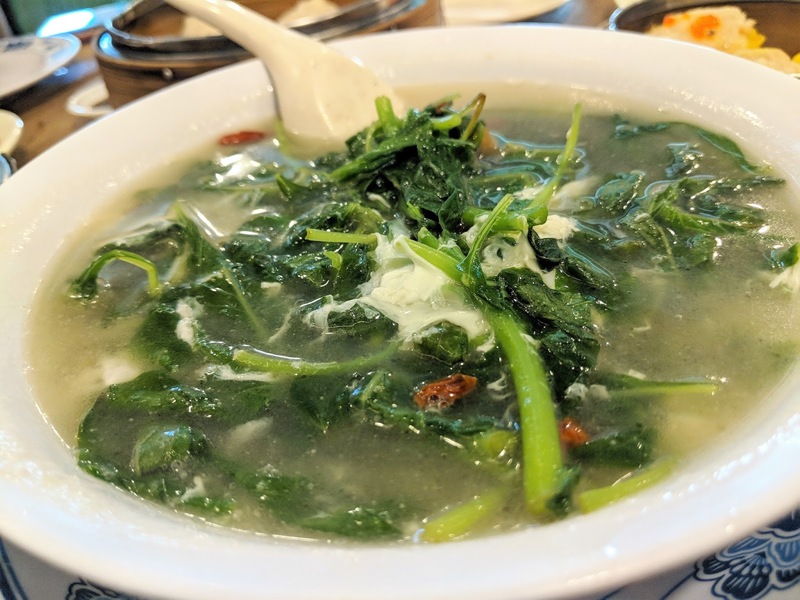 The soup tasted like spinach. There were bits of century eggs in the dish. There are many sets listed on the menu and this is perfect for any gathering among friends. The prices of the sets look reasonable. 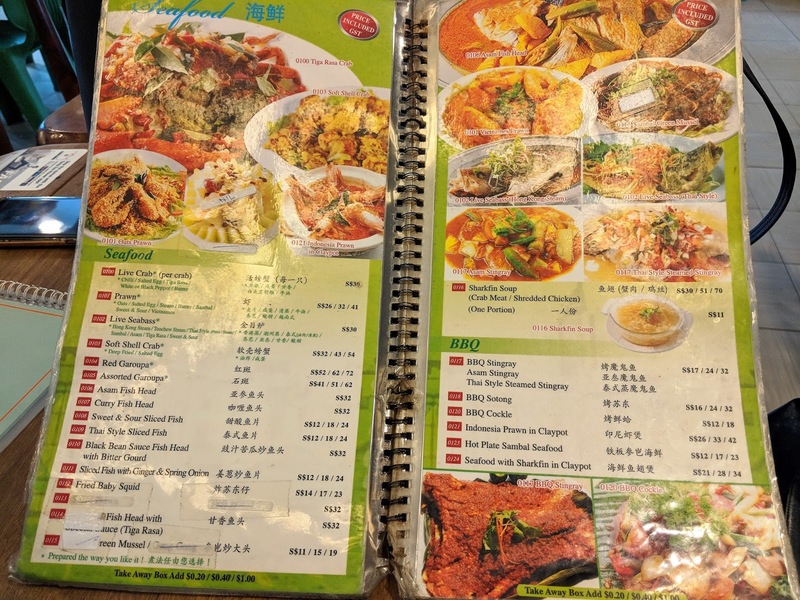 Look at the Seafood menu! The pictures look very inviting. Many diners were having a seafood feast. The Dim Sum menu looks very impressive. 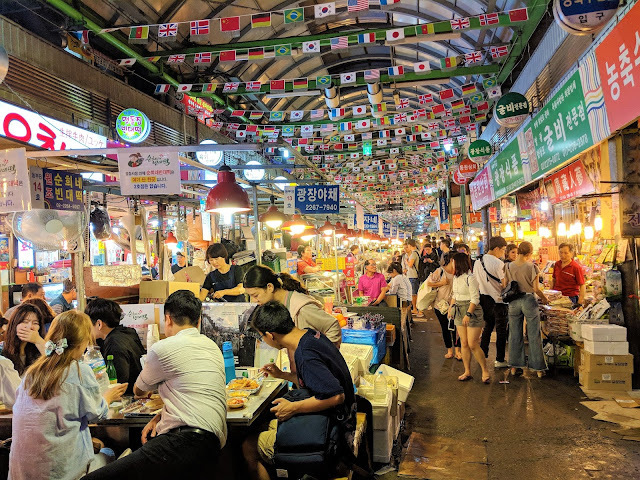 It has a variety of steamed and deep fried items, making it a perfect place to catch up with your friends in the afternoon. Another plus point is that Tang Tea House serves very good Kopi and Teh. Tang Tea House has both indoor and outdoor seating areas. The air-conditioning made it a comfortable place to dine in. Overall, it was an enjoyable experience. Now, I know where to jio my Muslim friends. Tang Tea House has four outlets - Bedok, Jalan Kayu, Jurong and Lelong Bekugong. Check out their website for more details. 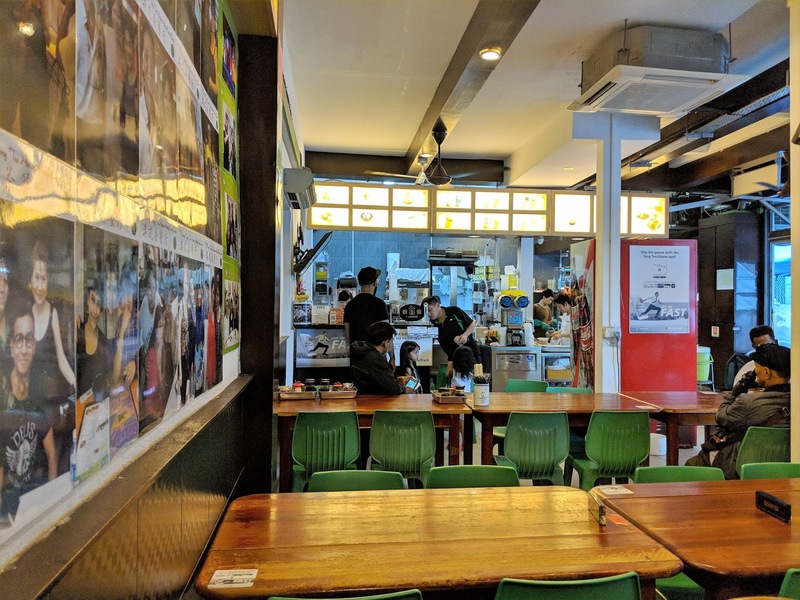 The Jalan Kayu branch is opened until 3 a.m.!